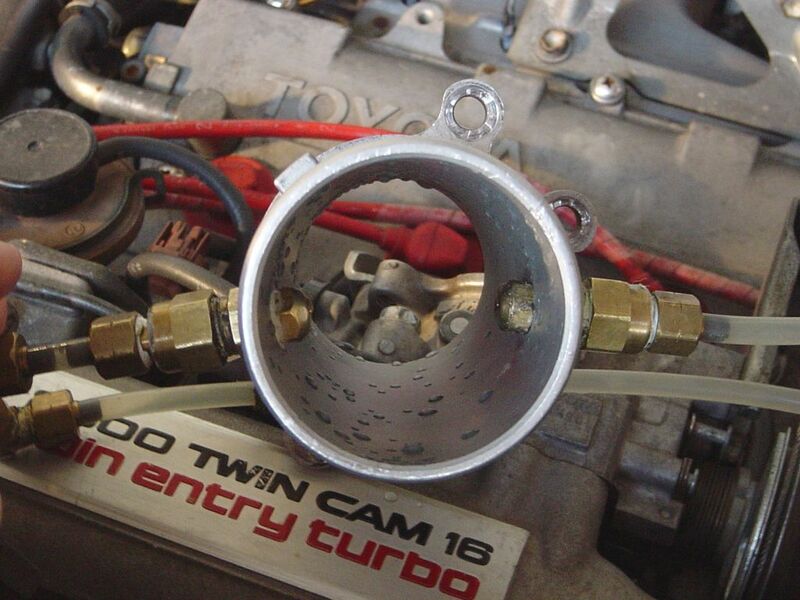 Here are some images of the mcmaster car nozzles mounted inside the throttle body. An overview video of the water injection setup is here (WMV format 8MB) – it’s a little nerdy – but all in good fun! 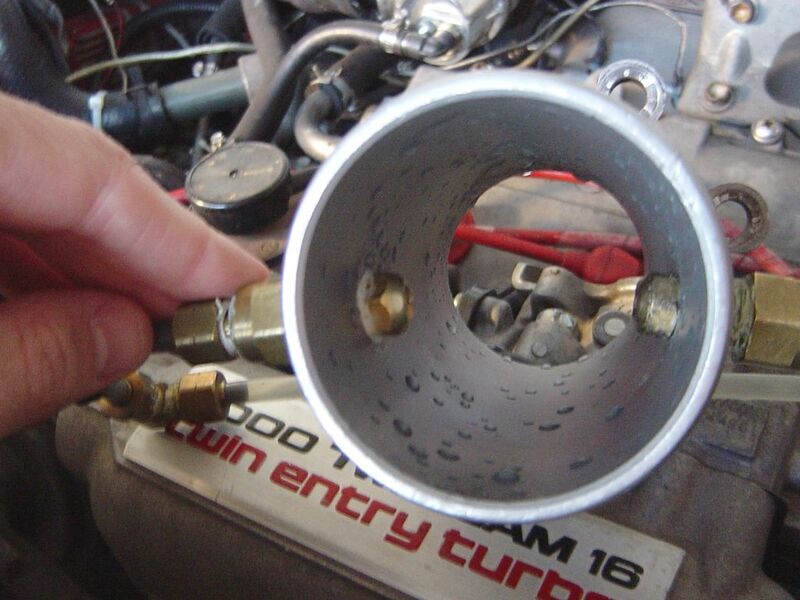 Video of each of the nozzles spraying inside the throttle body is here (WMV format 4.7MB – MPG format 19.6MB) and another of both spraying is here (WMV format 1.5MB – MPG format 6MPG). In the first video one can here the Shurflow pump turn on for a few seconds to re-pressurize the accumulator at two points during the video. Update (12/16/2002) – new Nozzle size. I’ve switched the two mcmaster car nozzles from a 3GPH and 5GPH, to a 5GPH and 10GPH for a total 15GPH or 946cc/min. This is not the actual flow, however, since I’m running almost 20psi of boost, and the water pressure fluctuates between 70 and 100psi. So at 70psi of water pressure, and 20psi of boost, the actual pressure is 50psi. The shurflow pump is adjustable, and I want to try to change it so that it will turn off at 100psi like it already does, but come back on at around 85-90psi. Using the formula where F represents flow and P represents pressure, one can calculate the flow difference. In this case the nozzles should flow 15GPH at 100psi, so at 50psi, the actual flow is 10.6GPH or 668.75cc/min. At 80psi the actual flow is13.4GPH or 845cc/min. So, with the current setup the water flow can range from 30.4% of fuel flow to 38.4% fuel flow, assuming the 550cc/min injectors are static open. The 3SGTE runs great with this setup – nice and smooth. The previous day (about 40degrees outside) I was doing some tests and the ECU went into the bad gas mode (see TVIS document). So, I thought it would be a good idea to raise the amount of water injected. So far, it’s running great – same boost, same outside temperature, no bad gas mode. It’s possible that it went into bad gas mode when the water pressure was at its lowest – that coupled with the low outside air temperature. New Version 2.0 Water Injection! The Shurflow pump has an internal regulator set to 100psi. 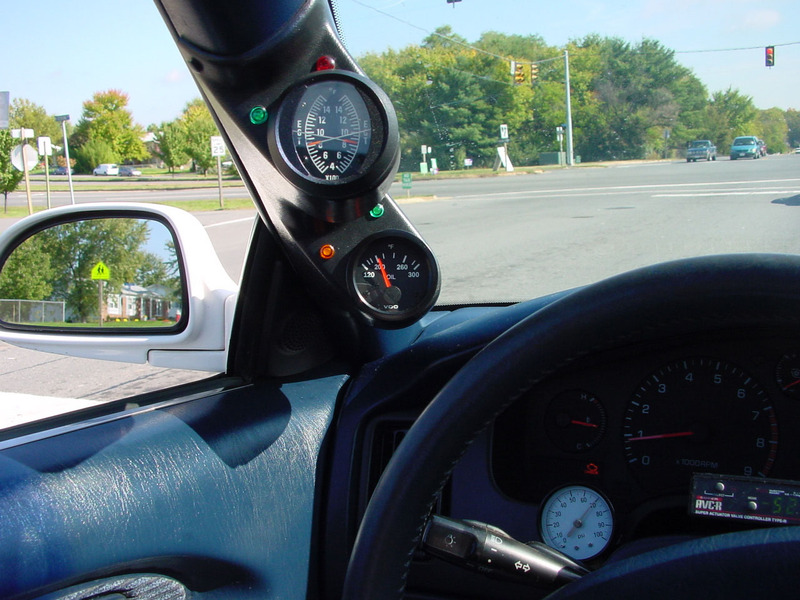 The pump is therefore supplied with +12 volts at any time the ignition switch is turned on. The two solenoids are controlled by the two pressure switches T’d into the intake manifold (boost pressure). The solenoids and pressure switches were purchased from http://www.poweraire.com. Total cost for the setup was approximately $30 per solenoid, $40 for accumulator, $80 for pump, $20 per pressure switch, $10 for the gauge from Lowes hardware, $10.00 for the nozzles, $30 for various fittings, hose etc, and about $15.00 for wiring, LEDs, fuse and so forth – so a total of ~$275.00 not including shipping. The current nozzles are a 3 gallon per hour (first solenoid) and a 5GPH (2nd solenoid) nozzle for a total of 8GPH or 504cc/min at 100psi. The current tank can hold about 1 gallon of water, so the setup can support full boost for 6 minutes. The pressure from the setup varies from 60psi (where the pump turns on) to 100psi (where the pump turns off). By using an accumulator, the pump runs very infrequently. During ‘normal’ commuting of 50miles a day, I see the pump come on about 2 times. It takes a good while for the pressure to drop from 100psi down to 60 where the pump turns on. Once the pump turns on, the pressure builds very quickly from 60psi to 100psi; about 2.5 seconds. I’m currently running 19.2psi of boost with this setup, and the ECU seems happy so far (no knock mode). Personal best 0-60MPH time is 4.8 seconds. Currently there is no more intercooler mister, as I wanted to keep the hoses going from the solenoids to the throttle body nozzles as short as possible. By keeping these lines short, there is minimal dripping after the solenoid closes. It also ensures that when the solenoid opens, water will flow immediately. I’m planning on adding an additional solenoid and nozzles to mist the intercooler and possibly the front radiator under high boost conditions. My most recent run with the GTech performance meter shows 258HP running 19.2 psi. More pictures on the MR2 picture page. I’ve finished putting together and installing my own water injection setup. It uses a pressure tank that contains a water bladder. The tank is 2 gallons. 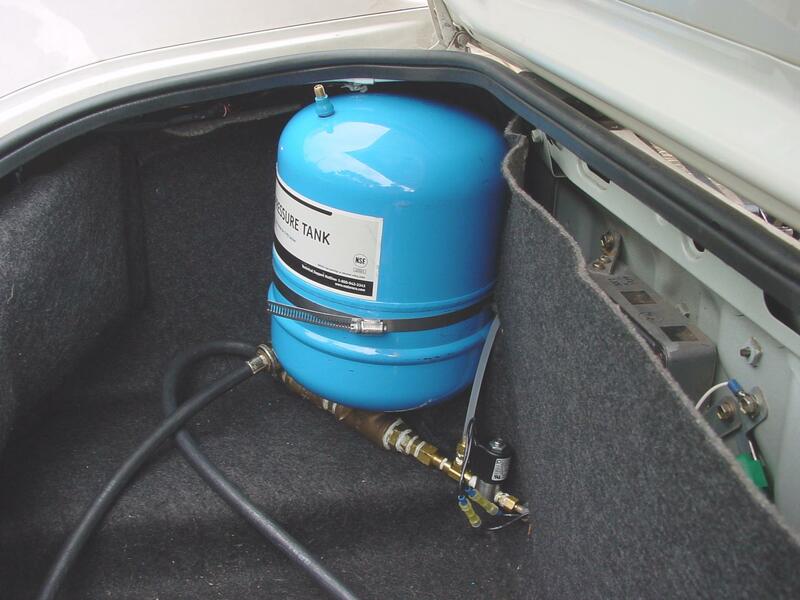 I fill the water bladder with one gallon of water, and then pressurize the tank with an air compressor to 100psi. The setup uses two pressure switches to control two misting water nozzles (mcmaster car mini-mister nozzles). The first nozzles comes on at 5psi and sprays water onto the outside of the intercooler. 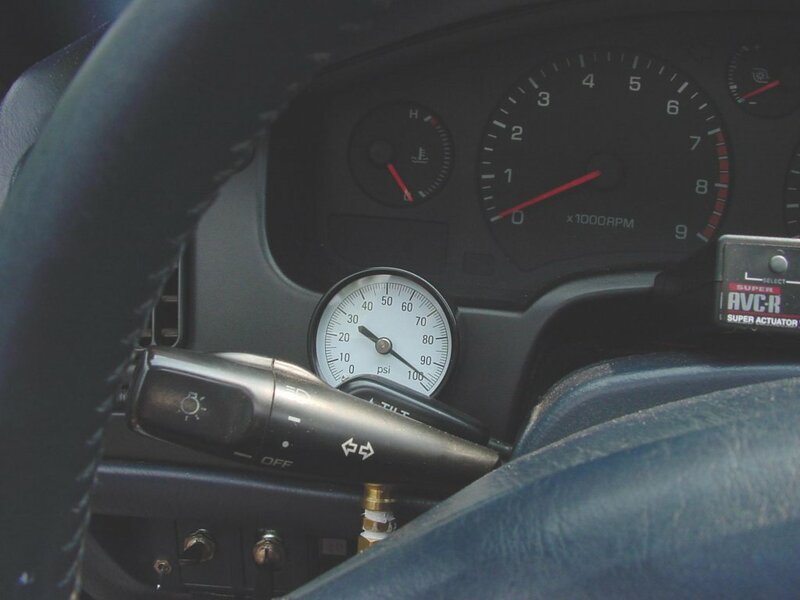 The second nozzle comes on at 10psi – currently using 189cc/min nozzle at 100psi, and injects right before the throttle plate. The pressurized water is controlled via two solenoid valves. This allows the not only a fail-safe for the throttle body injector (in case one solenoid fails), but also permits the use of a second nozzle for the intercooler mister. No Pump – no pump delay – injection starts immediately. High pressure – excellent atomization (at 40-100psi). Turn on pressure easily adjustable via adjustable switches. Able to run with denatured alcohol. Filling the tank is somewhat cumbersome, but not too bad. Have to drain air out, open valve, and gravity feed the tank occasionally letting excess air out. 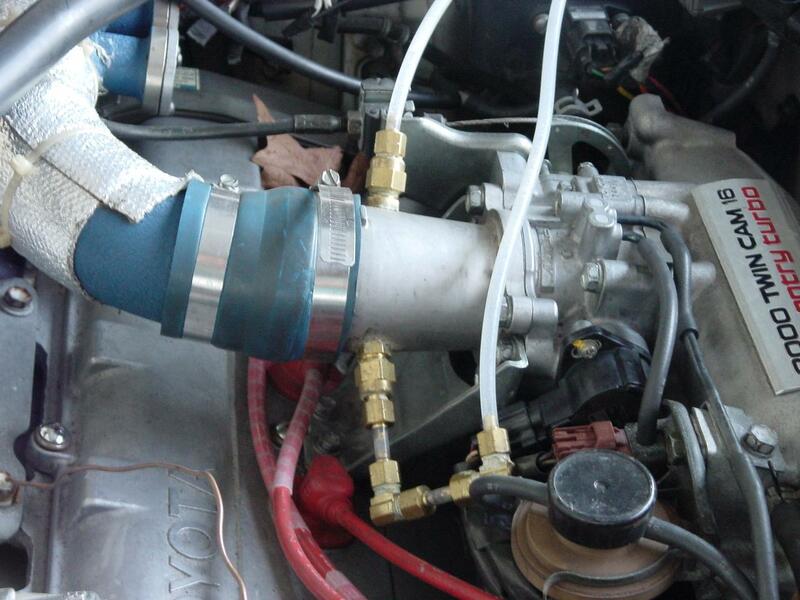 After filling – close the valve, and pressurize via air compressor. On a two gallon tank, with one gallon water, and one gallon 100psi air, after all water has been used, pressure will have dropped to 50psi. 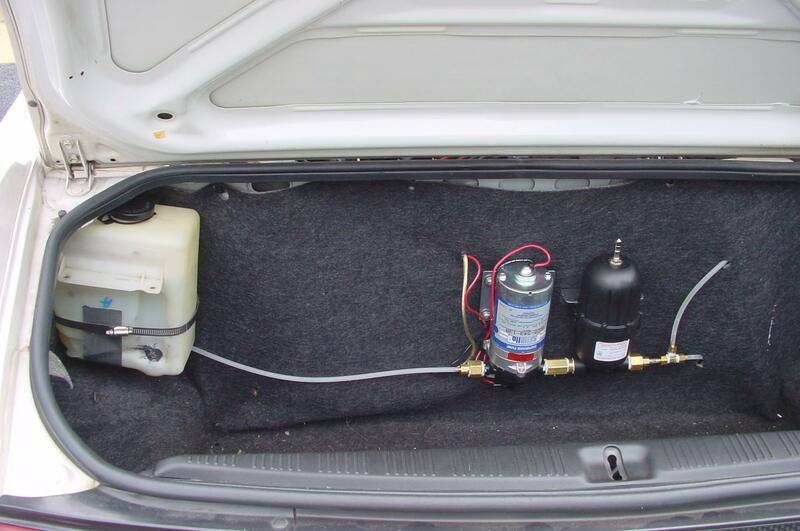 The user can just re-pressurize the tank – but that leads to – Knowing how full the tank is. I’m still working on this one – can use pressure reading to see how full, but would be nice to use an additional pressure switch to turn on an LED when the tank is empty. I attribute the lower numbers with the alcohol to the engine running too rich – but that’s just a guess. I also did a my personal best 0-60MPH time with distilled water at 15.6psi – 5.22seconds. More pictures are on the pictures page. Oh – BTW – the nozzle for the intercooler is 315cc/min. 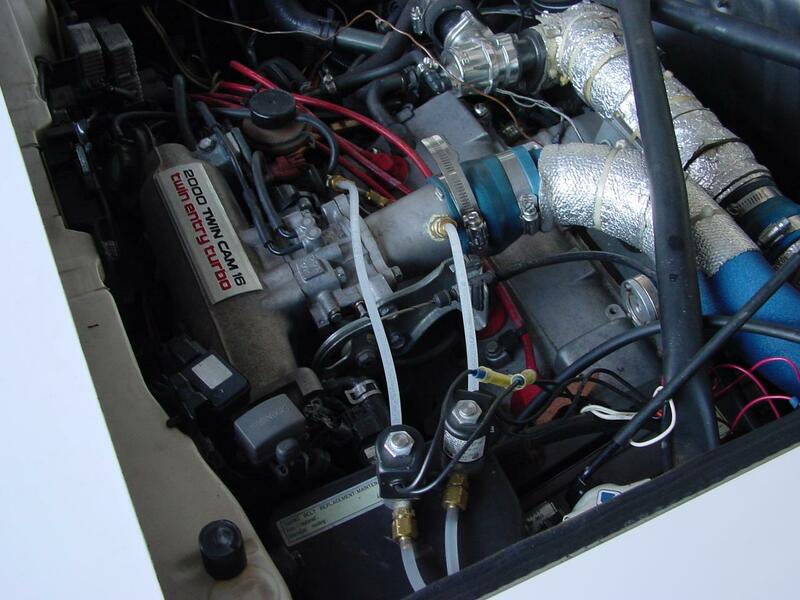 So one gallon of water will last about 7.5minutes – course that would be under boost conditions – with just the throttle body water injector it would last 20 minutes.